This mask is easy to apply and similar to most other sheet masks. Wash face and dry skin, remove mask and apply to face, wear for 15 minute, remove mask and massage remaining essence in to skin. I found the material of this mask a little thicker than I prefer - I think the foil material added to the thickness. But, they don't smooth and adhere to the face quite as well, so there were certain areas that the mask could not lay flat on. Potentially, if there were more tabs, the mask could have fit better. This did have about a handful of extra essence in the package that I applied first. This wore for about 20 minutes and had a little essence remaining to massage in. I thought it made my skin soft and hydrated - I could see my skin appeared clearer the following morning. I think I have tried better masks than this - both from Sephora Collection and foil masks. It was fun to wear, but not the most amazing results. 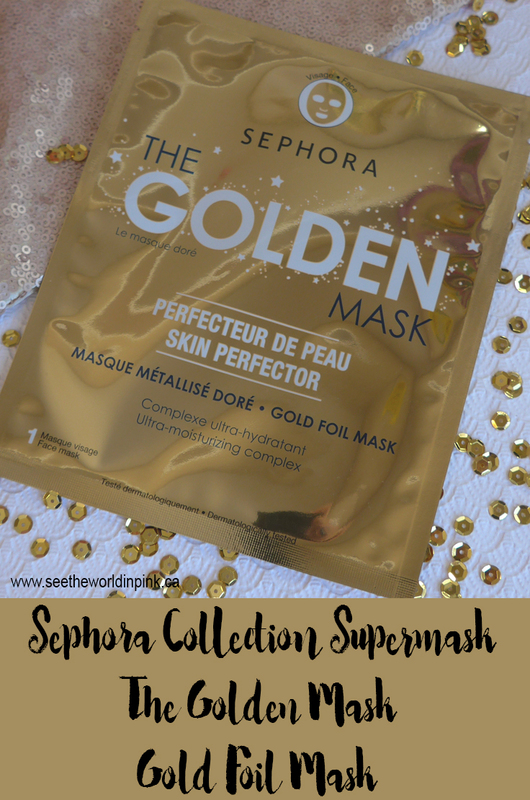 I recently tried the Sephora Collection Supermask "The Mud Mask" sheet mask and it delivered better results my skin looked so clear and bright and it was very soft! You can see my thoughts here. If you are looking for a foil mask, I would highly recommend The Face Shop Anti-Aging Foil mask - you can see my thoughts here, but it is half the price and worked so well! I love trying out new masks too!!! I love a good mask! Ahhh - so good! Me too!